In memory of Manuel Brum, A longtime volunteer of the Portuguese Association of Manitoba and all portuguese soccer teams. 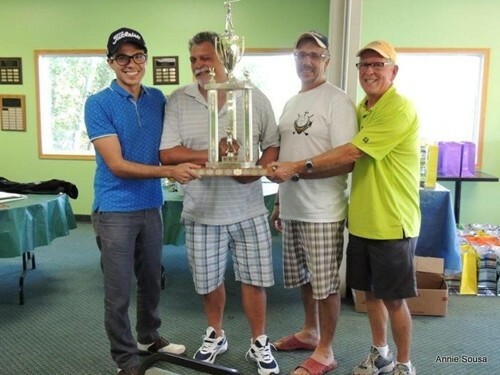 Held at cottonwood golf course on August 24th, 2014, organized by Manuel Felgueiras, Fernando Sousa, Carlos Gonçalves , Ken Steeds and Manny Bettercourt, with the help of volunteers, Tony Rocha, Ryan Miller, Tony Brilhante. This is one of my favorite tournaments to attend, not because of its location but because of the people that attend, getting together with old friends , great food including the classic “bifana” hole and wine , at the end of the tournament all golfers gather in tradition around an open grill to cook their own steak and share a few laughs, what started at a cloudy rainy day turned into a beautiful sunny enjoyable day , Manny Brum must of been looking over us and sent us the sun !! Next year Manuel Felgueiras and I will be putting our tournaments together, stay posted for its new location, a guaranteed good time! !